LOL! Thanks Jody!! Come on over! Thank you!! Send me a pic when you get it done! I love it! I also like the simple is more approach too! When I first started blogging, I got so caught up in the cute DIY projects I could do! Then I took a step back and realized I didn't have all the space for that stuff! So I decided to try the larger items (like your chalkboard which is great btw, can't wait for the tutorial on that!!) to make a big impact instead of a bunch of smaller ones. Bigger ones are easier to clean than a bunch of small ones anyway, right? :) Ok, so I am rambling, but I really love the tabletop, and everything about the room, really! Your house is gorgeous!! I love your comment, Jessica! I did the same thing! Have a great evening! And thanks! Thank you, Michele! That is so sweet of you to say! With kids and laundry, it doesn't always look this way! LOL! Thanks again! I LOVE your house! Your house is picture perfect as Michele said above! Thanks so much for sharing. Little by little I am transforming mine to replicate yours! That is so beautiful! I love it. I wish I had your creativity, but you inspire me!! Thank you Chris! Its so nice to know that I can inspire! Ooh my gosh! I am in love with this post, everything about it! You did an amazing job on your table, it is exactly what I have been in visioning doing when we get our own house! Thanks for all the inspiration!!! I love the new table top!! Your house is beautiful!! I love your new table Diana and how special it is that you created it from your heart and hands...so many memories ya'll will make around that table. I can't wait to see your porch. I've been doing a little outdoor decorating myself...hopefully it will all come together and I'll post some pictures. This is fabulous! I love your dining room....I have been debating on painting my 2 antique pieces (buffet and credenza) to match my two tone table black/wood...but its not the farm table my husband have always wanted. Im thinking of pulling off the top and making my own....you have now given me the mojo. Maybe I redo the antique pieces and sell them in my shop. Im also loving the less is more style. I have 5 children and although I love sentimental things Im noticing that Im packing up things and either bringing to the shop or away. Anyhow...this is just awesome in everyway....Can't wait to see your tutorials. Im a chalkboard and pallet fanatic. Chalkboards and pallets.......I can't get enough! Thanks MJ! Love your dining room. Both the table and the shelf are awesome. I love your table! It's beautiful! The new table top looks fabulous. All the care you took with each step to get the finish you wanted really paid off. It looks like that top has been married with those legs forever. I like how you have edited things in your dining room. I thought it was lovely before...and it still is with your new tweeks to it. You are so gifted .... love the new table and can't wait to see the tutorials on the giant chalkboard ! Every time I use my bread boards I think of the time and talent that went into them ! Me gusto mucho el cambio , aunque antes tambien estaba bien !! I love this new table....and all your other furniture in your house...so awesome...greetings from germany!! Your rooms are some of the most beautiful I've seen! I love everything in this dining room! Your dining room looks incredibly beautiful!! I rmember liking the table before, but now it it perfect! Great job! Always check the sink before you buy your utility sink faucet because not all faucets are compatible with all sinks. Ascertain that you shut off the water source before you start your installation or replacement. Love the dining room light fixture. Would love to know where it came from! Your dining room is lovely and welcoming. What a wonderful place for your family to enjoy meals together. You made so many of the furnishings and they are beautiful. You are a very talented person. Thank you for sharing your expertise and style. Please tell more about the banner with the place names on it. That is stunning. Were there any gaps inbetween your boards on your dining room table? How does that workout with dinner crumbs? Or did you fill the cracks? Thanks for any help! I would like to know the answer to this as well...any gaps? I love the shelving to the right in the last pic, did u make that? I'm curious why you used the finishing wax paste instead of poly on the top. Any special reason? I just stained our coffee table the same color and need to seal it, perhaps I'll follow your step of distressing it first too because its absolutely amazing looking!! Hi Shannon, I'm just more of a fan of finishing wax than poly. Poly is kinda hit and miss sometimes as far as the finish goes and wax just makes the finish seem more consistent throughout the piece, if that makes sense. And so much easier to apply. Hi Diana, You really are an inspiration to us women (& men) who are afraid to tackle a make over. It really doesn't take more than inspiration and a little know how. Do you ever go to sleep? Does the hamster ever come off the wheel? Does your husband run when he sees you having an "A HUH" moment, like a light from heaven shining down upon you? LOL, I can't tell my husband quarter of the stuff running around in my brain for the fear he will flee. But seriously, you really inspired me in my house renovations and for that I'm grateful. BTW PLEASE!!! tell me what color your kitchen is? Is it Manchester Tan as well? Love your Vintage Home. Blessings from New Brunswick. Hi Kathy, your comment made me LOL! Yes, my husband does sometimes run when I mention my ideas, quite a lot actually, even tries to convince me that something won't work, which makes me more determined. In the end, he's always proud of me for not listening to him grumble and accomplishing what I set out to accomplish. :) I do sleep, but sometimes my crazy thinking process keeps me awake, ha! And believe me, I have had plenty of failures in the process, I just don't let them stop me or get me down, as far as home decor goes, anyway. ;) Thank you for your kind words. The kitchen color is called light gray and it's by Farrow and Ball. So happy I stumbled upon this on pinterest. I have been scouring the Goodwill stores looking for a cheap kitchen able I could fix up and convert into a coffee table/kids activity table. I think I will do this instead for about the same price! Love it! Thx! I SO love the shelves you built for your ironstone...how do you get your plates and platters to stand up? Do you use plate stands? LOVE this room (and your ENTIRE house)...keep these awesome posts coming! Everything is so inviting and says "welcome home" so elegantly, yet is still cozy! SO happy that I found your blog! My husband and I just bought our first house and you have inspired me to do a lot of the renovations myself! Thanks for sharing!! I love your room> I planned on making my own table myself and painting everythings white too. Glad to have saw yours , lovely I am going to my nearest store. Thanks. This is exactly the look I'm going for with my dining room! Love your blog and looking forward to exploring!! 1) after using the table for awhile, would you recommend using gorilla glue, or something similar to seal the space between the boards? 2) what color did you use to paint the legs? Hi VIctoriam. I was curious if you did this project with the ikea table? I was thinking of doing the same for a ikea coffee table today. Just curious bc I would love to see how it turned out. I am most worried about making it look distressed like the picture shown here. Its so beautiful. I hope I can do it the same! thanks. LOVE this so much! How long was your original table? completely coveting your amazing skills and attention to detail right now!!! You have such an incredible talent. hi, i just found your site via pinterest. i love the look of your table, and am in the middle of constructing (well, ok, my dad is constructing) something similar. i am wondering about the durability of a waxed top, instead of one with a eurethane of some sort. how's it holding up? I love EVERYTHING about your dining room - not only your table. Great job!! did you take off the table top? Thanks!! I know I've seen your table before but I'm seeing it with new eyes this evening because we've been looking for an old table for my back porch. You've opened up a whole new possibility! Thanks, Diana! The table looks amazing. We would love to do one like that. Which kind of wood is that? is it pine? Love it! Creating things yourself make a house a home! Fantastic make over! You really made the room look fresh and new. I came across your blog through a friend of a friend and your table/dining room is wonderful, but what I love most is how delightful you are. I love how you comment back to everyone. You have such great energy. Thank you for just being so nice. You have such a wonderful blog and a beautiful home! 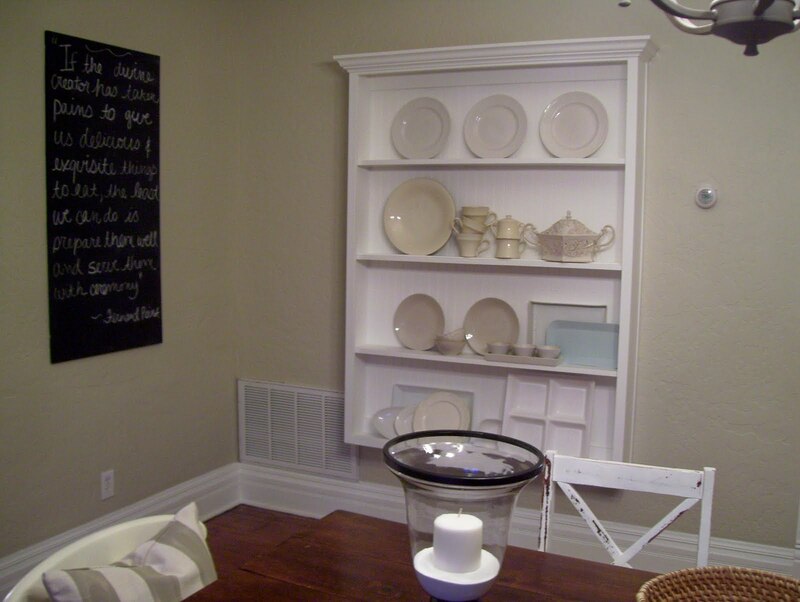 I love your dining room table and everything in it -- I especially LOVE that wood open shelving unit on casters in the last picture -- did you make that or buy it?? It's gorgeous and exactly what I'm looking for, for my dining room! Thanks for the inspiration, I will definitely be coming back! Nice job!! Building a new dinnIng room is on my to-do lisT (if I ever come up with enough spare time). Yours turned out FAB!! Can you add a picture of the underneath side of the table? yes ! please pretty please ! Where are the chairs from? And how was the bottom made? Thanks! Love your home!! Oh, my heavens....Here I was, admiring your dining room, thinking...wow...love that paint color. And lo and behold I read the bottom of your post and it said BM- Manchester Tan...I just finished painting my dining room Manchester Tan yesterday! Yay Me! That makes me so happy! Where did you find your chairs to put with this table? It's beautiful, I love it! IKEA has similar chairs that come in black-brown and wood finish for $59.99. They are called INGOLF chairs. What did you use to paint/stain the top of your tabel to make it look like that? I can't seem to find the wax finish at Lowes. I too hate shiny wood and would love to finish a few home projects with a wax top. Anything extra you can tell me about it or how to find it would be amazing.. I love your table. I want one just like it but I love counter height tables and I wouldn't know where to start to find chairs to match its beauty. It looks amazing. Great job and its wonderful to see so many great photos. I'm off to Lowes. Diana, I love what you have done to transform your house into your "home." I was curious what color white paint you have used on your dining room table bottom, and the other white pieces of furniture you have scattered throughout? I was also curious if your sofa in the living room is white or off white. Whites can be funny to work with and yours seem to work perfectly. Thanks for sharing your amazing work! Where did you get those chairs? We are looking fog white chairs and those are perfect! I love your blog! Haven't read through much but I love your style and the simplicity yet beauty you bring to your projects. My husband has built a few things for us and I love the uniqueness of each project. I'm pinning and pining away! Have a blessed day! I wish your blog had Pinterest "pin it" buttons on it. Would love to share your wonderful pages. I loved your table so much I'm selling mine and have started the process to make this one. I have painted the bottom and chairs and now I'm ready to make the top, I'm so scared!!! I have 3 kids under 5 and I'm wondering how this table cleans up. Is it hard keeping it clean and do things fall through the cracks? Also i was wondering if ur wood that u bought were all the boards were perfectly strait, mine ard looking a little curved Thanks for your help. I would also like to know what type of wood was used! I continue to come back to this page and look at this table. It is breathtaking, and I hope mine will turn out the same. You mentioned you got 2x8 untreated wood, but is it Cedar or Pine? I'm looking at Lowes online and am having a hard time figuring it out. Also- it shows you used 5 boards, and the table is 3 feet in width... it's not adding up for me. Help!! Wow! That is amazing!! Love the table, I truly would love to build one but my time is limited so it's on my "In the future Todo list". Amazing and what an inspiration. I adore this table. This is exactly what my husband and I were dreaming of for building our own dining table. I was wondering how tall are the table legs you're using? I'm not sure if we need to use 29" or 35" height for the legs. Thanks!! LOVE your designs!! Where did the NYC print come from?? did you just have the table legs, or were they already attached to the apron? this table is incredible btw! Omg! So gorgeous!! Question, did you stain all the sides of the wood? Or just the top and sides? So lovely! I like the white concept on each area. Thanks for the about Dining Room Sets technical Info. I expect much from your blog. Howdy! I am going to build your table as surprise for my wife. I'm just wondering how you mounted the table top boards together? where did you get the kitchen chairs that you have in the picture? Just wanted to say thank you so much for your inspirational blog! I finished my table today and I LOVE it. I blogged about it here if you want to see some pics! Useful information provided about dining room table for better home. Thanks for sharing. Hi! I stumbled upon your blog on pinterest (this table to be exact!) and my fiance and I love your blog! We have just moved in to our house and are fixing up as we go. We love the vintage style, so you are becoming an inspiration for us! I have a question :) The "Curio" in your picture, did you make that? If so how? I LOVE it! I'm sorry if I missed this tutorial or if someone commented about it already. Thank you so much for sharing your home!! I found you through Pinterest as well. Love the table. Where did you get the black subway-like sign? Enjoyed the tour! I ran into to this tutorial about a week ago on pinterest. I'd been looking for a farmhouse style table for awhile, but they were all out of my price range. I ended up making this over the last two days, with just a few small changes. I braced the legs on the outside of the apron with metal brackets, but left out the angled wood braces on the inside. I made the wooden brackets under the table top to fit snugly within the frame. I wanted to be able to leave the frame and top unconnected, because boy, this bad boy is heavy! It came out beautifully! Thank you so much for the inspiration! I'd love to send you a picture. Just got done sanding 4 planks that will someday (soon) be a table for my apartment. We'll see if this entire project can be done in my little place (& the sidewalk outside). Home improvement stores = beyond helpful! And your post started it all. Thank you!! Thank you for sharing your project with us. It looks like it involves a lot of handy work. I wish I could do something like that. However I am very satisfied with my replacement table tops. They add a new dimension to the room without having to put all of that work in. Thanx so much for sharing! I have an antique library table that has some type of funky worn leather top on it that is beyond repair yet the rest of the table and detail on it are in incredible shape, very solid. I've been contemplating doing something like this for a while now and seeing your post today make me realize this was the perfect solution. You rock!! Love love love both your before and after. I was in the process of refinishing my dining room table when my husband suggested he just make a new top for it. Music to my ears as I couldn't imagine how my redone top would look as it is veneer...that being said, I remembered I had pinned your table and went back to show him the finished product. In re poking at it I realized your "old" table centerpiece hurricanes are exactly like my new ceiling light fixture in my hallway. Any clue where you purchased them? Or if you are ready to part with them I would be willing to buy as they will fit perfectly! Just a thought. Again, awesome living space! Sharing your project with us. It looks like it involves a lot of handy work. Your dining room is fantastic, I love the vintage feel you have going throughout your home! Do you have a tutorial for your chalkboard? Love how big it is!! Oh pretty please share the paint color in your dining room! Stunning design! Love this table!!! I am so going to do this!! What color of white did you use on the rest of the table?? I am swati, I am also a web designer and I like your blog too much the colors and themes are really nice. How long did you let the stain dry? When you said several hours, did you mean like 3 or 4 hours or closer to overnight? This blog is just wonderful.The dining room table is the most noticed and most used dining furniture.Your dining space is definitely one of the primary units of your house as that is the place where you have your meals. Therefore the dining room should be decorated in such a way that would make people enjoy their meals all the most. Nice blog you share nice information. This is a great table! We are building one very similar to this right now. I am curious how well the wax finish has held up since you made this? We have 3 young kids and our table will be our only dining table and will be used many times a day. So I wondered how well it holds up against daily wear and tear, setting drink glasses on it, etc. Thanks so much! I want your house AND the large chalkboard to-do!!! I love it and want to put it in the mudroom right next to our kitchen!!!!! When will you post?!? Where did you get the NYC banner? Could you please tell me how you created the cushions for your dining room chairs? Im so stunned with the design of your whole place. I really like that table and the blinds on the window. Maybe I get new windows in Prince George redoing my kitchen can be my next project. Like the furniture that you've shared here. So nice. Love the table!! I have been searching for one of my own, but I can't see paying what they want for one. I understand how you did the top, but how did you do the base with the legs? Thanks! Love the room and the table! Trying to gauge the size of the new chalkboard you built. What are the dimensions? is it over six feet? I think this room was beautiful before too! Where did you buy that kitchen table? Do you happen to have any recommendations for where I can find vintage dining room furniture stores in Dudley, MA? Please let me know, thanks. This looks so good!! I'm a sucker for nice looking dining room furniture in Vermont . I hope to get a table much like yours. Love this idea! And your dining room is too cute! Love it all! New to your blog!!! You have wonderful tastes, Love the table and I love your front porch!!!! I am a sucker for front porches!!! On this post, you mentioned a tutorial on the giant chalk board. I tried a search but could find it on your blog. Did you happen to post one, or is it still in the works? Thanks!!! This is awesome! This is the kind of home that my wife and I want to have. We've been trying to find some dining room furniture in Vermont that will go along with this, and this gave us some insight for what to look for. Thanks for sharing! That's great information which you have provided in your post. Thanks for sharing such a valuable and informative post among the users. I think brown with white is a great combination of colors especially for the dining room. You have given me a great idea which I can apply for my dining room as well as I have a wooden table and I can put a nice brown and white rug which will complete my design. Wow! This is all beautiful! Thanks for the post! My dining room furniture in Vermont definitely needs an update and I like the vintage style. I will probably use some of your ideas. realy nice table i built 2 farmhouse tables 6x3ft with 1in pine 3 board tops this summer one white shabby chic and one with stained top i am going to build one like yours next summer with the thick top for a friend.yours is a beauty. I really like the table, but I really LOVE the barnwood shelf with the wheels. Anyway you could put the dimensions of it out there? Oh and the depth is 11 inches. How many inches are the table legs? Can you tell me what type of wood you used for this table? Pine?